In casework, doweling can be a good choice to join the end grain of one board to the face grain of another across their widths. This method for making cabinets was described and popularized by the late James Krenov in The Fine Art of Cabinetmaking. While noting that dowel joinery opens up many design options where the sides meet the top and bottom of a cabinet, Krenov warns us to use good judgement in selecting it for a piece; though durable, it is not for heavy-duty work. The joinery in the pieces I have made with this method has remained tight for many years without a hint of problem. Nevertheless, some doubts have lingered in my mind about a joint that involves relatively little side grain gluing surface compared to the gold standards of mortise-and-tenon and dovetail joints. I wanted to see what was really going on inside dowel joints. To do that, I had to make ’em and break ’em. My qualitative observations, combined with some intuition and educated guessing, are informative enough for my purposes. This is not a joint strength test, nor is it scientific. The photos show typical results. First, let’s look at the “end-grain side” of the joint where the long grain of the dowel is parallel to the long grain of the board. Using a DeWalt Pilot Point bit and a Krenov-style jig, 3/8″ holes were bored in poplar in the long-grain direction, deep enough to allow 3/4 inch of dowel insertion plus room for excess glue. Glue was spread only in the holes. After 24 hours, the wood was sawn through the middle of its thickness. Each half was secured in a vise, and each dowel was then hit with a hammer toward the open face to make the connection fail. The photos show the dowels snapped backwards, exposing the half hole. 1. A made-in-China (MiC) dowel glued with Titebond III. 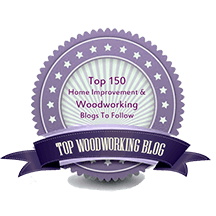 Fair adhesion – some wood is torn away. 2. A MiC dowel glued with Titebond No-Run No-Drip glue. The bond largely failed as evidenced by the relatively clean surfaces. 3. A Laurier brand dowel, made in Canada, glued with Titebond III. Plenty of wood failure, indicating a good joint. That’s what I’m looking for. The TB No-Run No-Drip glue is very viscous, and handy in that it doesn’t run down and collect at the bottom of the hole. However, in other tests I found it did not spread well over the Laurier dowels which have less space for the glue in their spiral flutes. There was too much resistance to inserting the dowels, the glue got pushed down, and too much pressure was created. 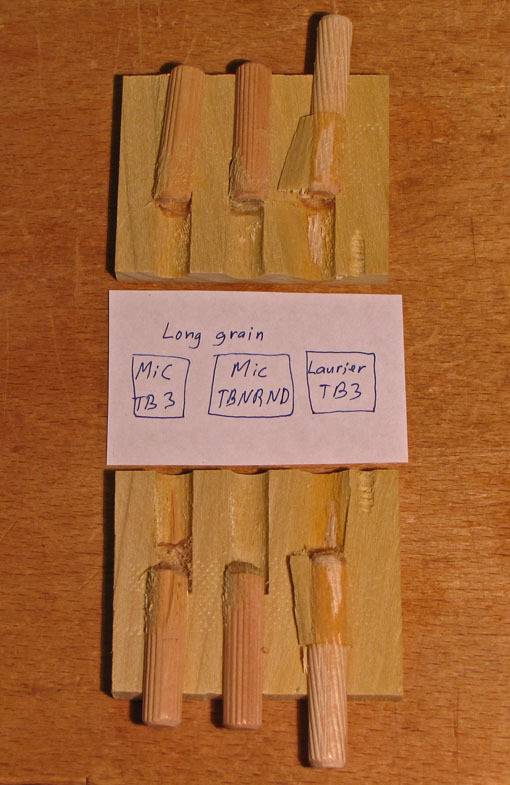 I thought it might work well with the more deeply fluted Chinese-made dowels, and they did go in easier, but TB III still made a better joint with them. Lee Valley sells the Laurier dowels. Grizzly sells the Chinese-made dowels. To keep myself out of trouble, I emphasize that these are not scientific tests, and my conclusions that I am sharing with you are for my purposes in my shop. These should be regarded as anecdotal findings. Please refer to the manufacturers’ and vendors’ literature and make your own choices. Of course, there is the other half of the joint to consider – the face grain board. Obviously, the same dowel must be used but it does not have to be the same glue in each half. So, in the next post, we’ll look at side grain insertion of the dowels with various options. This is the part of the joint that creates more doubt for me since much of the dowel surface is bonded to end grain surfaces inside the hole. The results of my tests surprised me. The “knock” on dowel joints isn’t a problem immediately following completion. Rather, the knock is long term longevity. The dowel will expand differentially radially versus tangentially. This, combined with a crossgrain glue joint (typically only 1 of the 2 boards has the crossgrain issue) which with a dowel is nearly all endgrain to long grain glue surface can lead to joint failure over cycles of moisture change or stress from use. Take a typical mortise/tenon crossgrain joint and the vast majority of glue surface is long grain to long grain, albeit cross grain. This is why m/t glued joints have a longer life expectancy versus doweled. When the joints are first made, I think a doweled joint is plenty strong enough. 30 years later the doweled joint is likely to be relying solely on friction/mechanical means to hold itself together. Interesting test. I’m a big fan of the Lee Valley dowels and have used them for years . They are a snug fit even without glue; you have to be careful when dry assembling. I’ve broken them on dis-assembly even without glue. I’m looking forward to your next test. Thanks for taking the time to do this. Tim has a good point. The seasonal expansion and contraction are what kill this joint… which is why using a couple dowels for a heavily loaded joint is not a good idea. Chair and table legs are out, and this is where I’ve seen (in my admittedly non-professional experience) the most dowel or circular tenon failures. However, you can always add more dowels, which will help, and you can use them for less intensive joints, such as for light casework/shelving. Thanks for the experiments, Rob. Any insight on spiral cut dowels? Mortise and tenon, dovetail, and dowel joints all involve seasonal dimensional conflict. Elasticity of the glue line (and even of the wood itself) compensates adequately in a well-designed and executed joint. After many years of building with all three joints, I can tell you that none of them have failed. The dowel joints are certainly not held together by friction alone! Nonetheless, dowel joinery is not a good choice for heavy duty casework. A key difference in dowel joints is that much of the glue surface area in the the face-grain board involves side grain to end grain. This is undesirable and does make me wonder what is really going on inside there. That, along with different dowels and glues, is what I am investigating in this and forthcoming posts. It is not a joint strength test! Would you consider a summary page? What about long term shrinkage of a dowel in a joint? Overall this is no doubt worth doing! 1- I prefer Laurier dowels, used with Titebond III or 202GF glue. b) cross grain orientation (the face grain board), with both the side grain portion of the hole and the end grain portion of the hole. These investigations were not designed to assess the long term shrinkage issue. I do note that the dowel joints in cabinets that I have made, and surely those of many other woodworkers, have held well for many years. I do not think the seasonal dimensional change issue is any greater for 3/4″ length of a 3/8 diameter dowel than for a typical tenon in its mortise, where there is dimensional change conflict for the length and width of the tenon, and even its thickness, to varying extent depending on the grain orientation of the tenon and mortise members. PVA glues and even the wood have some elasticity. Made properly in the Krenovian style and used in appropriate circumstances, dowels make a good joint.